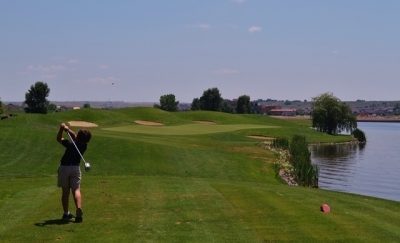 WINDSOR, CO – “Pelican Lakes boasts 7.5 miles of shoreline on its 18 holes which we believe to be the most of any golf course in North America,” remarked Stacy Kleve, Head Golf Professional at Pelican Lakes Golf and Country Club in Windsor, Colorado. Think about that. 7.5 miles of shoreline. Considering the average golf hole length is only about 350 yards, (which is about 1/5th of a mile), you would think Pelican Lakes would just about be all water and no greens. That’s far from the truth on this relatively flat but scenic piece of ground in the Rocky Mountain State. 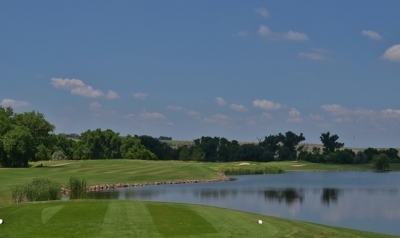 There’s no getting around it – Pelican Lakes has a LOT of water, but the playing areas are more than generous and the holes are laid out in such a way that the lakes complement the golf but don’t dominate it. In other words, you won’t lose two dozen golf balls unless you’re really hitting sideways. But if you’re hitting that bad you’d lose that many on any golf course. Kleve elaborates on how it all got started. 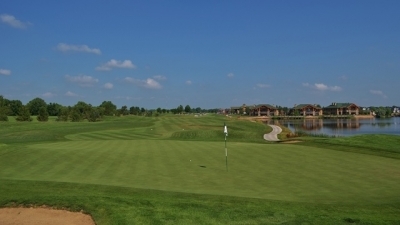 “The 18-hole Pelican Lakes opened on July 12, 1999 as the first public golf course in Windsor. The 9-hole Pelican Falls opened on July 12, 2006. Between the 8th tee box on The Lakes and the 1st tee box on The Falls was the original homestead of Benjamin Harrison Eaton. Block out the lake on the right of the par four 10th hole. At 216-yards, the par three 4th hole is no pushover. Eaton liked water. 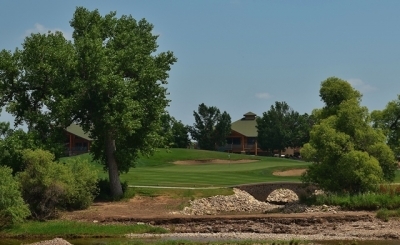 It served him well and now it serves northern Colorado’s golfers well at Pelican Lakes. Perhaps it’s fitting that the minds behind the golf facility hired the “king of waterscapes,” Ted Robinson, to design the golf course. Robinson was used to working with bodies of water to accentuate his golf designs, but even “the king” wasn’t sure the Pelican Lakes property would work for him. 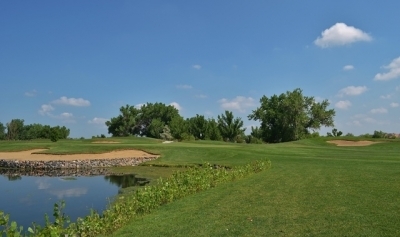 From the forward tees Pelican Lakes is very playable for juniors and beginning golfers. It’s true. Nature certainly did a lot of the water work for the folks at Pelican Lakes. But too much water can also be a bad thing when it comes all at once. 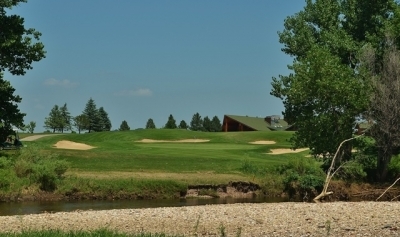 A devastating flood of the Poudre River in September of 2013 forced Pelican Lakes’ ownership to mediate several holes on The Lakes Course. During the winter of 2013-14 the first six holes on The Lakes, as well as #9, received a tremendous upgrade in terms of soil, landscaping, cart path rerouting and mediation. Kleve also said as a result of the flood the first six fairways were raised several feet, new sod was added, native areas were incorporated to allow water to meander during high water seasons, two cart paths were moved to the sides of the fairway instead of crossing over it, and gorgeous landscaping was added to tee boxes, greensides and surrounding amenities. They also added 79 Espalier apple trees of six different varieties near the first green. The idea behind the apple nursery is for golfers to pick one off after they play the first hole. The par four 8th hole is one of a few at Pelican Lakes with no water. Interesting concept. I wish I’d known that – I definitely would have taken advantage of it. The first hole is a relatively tame 411-yard (from the back tees) par four with a very generous landing area and a lake far to the left. The water is certainly reachable if you hook one badly, but as with most of the rest of the course, you should manage to stay dry if your game is cooperative and your aim is correct. The water accents the course but won’t spoil it. 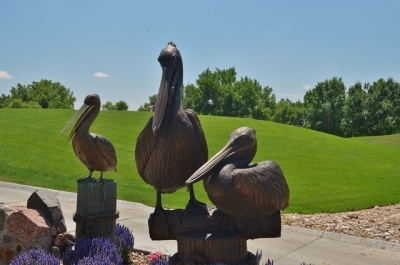 At Pelican Lakes, expect to find statues of…pelicans. That’s another thing we gathered from our day at Pelican Lakes. There’s a real sense of community there. Most of the clientele is local and they appear to take real pride in their golf facility. Pace of play was reasonable, the bunkers were raked nicely and people fix their ball marks. It was almost like being at a private club without knowing a member. Visitors from outside the area might be surprised that Pelican Lakes considers itself a year-round facility, open 365 days a year if there isn’t snow on the ground. Most people, including myself, associate Colorado with snow. But the climate is actually fairly hospitable even in the winter months a good deal of the time. The carry looks more severe than it is at the par three 9th hole. Frozen water won’t intimidate you. The lakes might, however. “The most challenging obstacle for golfers to overcome when playing Pelican Lakes is obviously the water. The fairways are nice and wide, but knowing there’s either a river or a lake on either side of the fairway plays tricks on the mind,” Kleve said thoughtfully. That’s definitely the case. 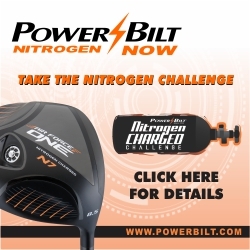 The region’s high altitude reduces the yardage by about 10% (or adds 10 percent to your usual distances). You’ll be amazed at how far you can hit the ball in Colorado, and if the course is playing firm, you get a lot of roll, too. 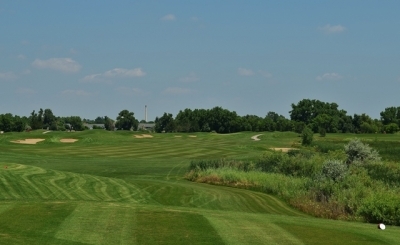 Ted Robinson crafted the perfect mix of water, sand and grass at Pelican Lakes. Here, the par four 10th hole. As would be expected from a Robinson designed course, visibility is the name of the game at Pelican Lakes. There are no blind shots other than a few hidden gems from the tee on doglegged holes. Fascinating. I didn’t see them but next time I’ll definitely seek them out. The squeezed landing area on both sides of the par four 3rd hole will test your ability to hit a straight tee ball. 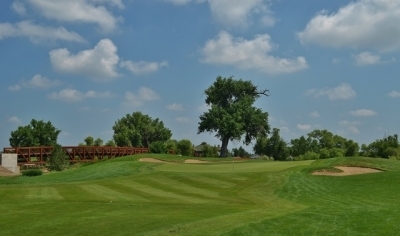 According to Kleve, hole highlights include the par four third hole, which could be the toughest straight par four in Northern Colorado. 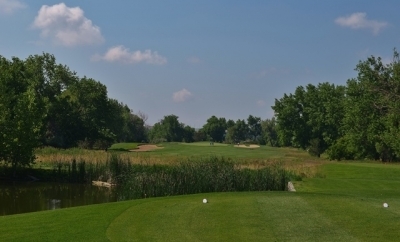 It plays 414 from the back set and 291 from the reds but the fairway is the narrowest on the course and is bordered by deep and thick native grass, and the Poudre River on the right. The green is protected by bunkers on each side and slopes from back to front. There’s not really a flat spot on the green which means there’s no easy pin placement. That’s no joke. Of the players in our foursome only one hit the fairway. Unless you really love your driver it might even be best to play it as a short par five and save yourself some penalty strokes. At 590-yards from the back tees the par five 15th hole is the longest at Pelican Lakes. Kleve says the highlight of the back nine is the 18th hole. We didn’t play the Falls nine, but Kleve says the highlight hole is #9 the finishing hole. The 521-yard par five 5th hole plays relatively short, but you will need to be deadly accurate for a solid birdie chance. No doubt. But with the beauty of the course and the surrounding long-range views of the Rockies, how can you be upset? 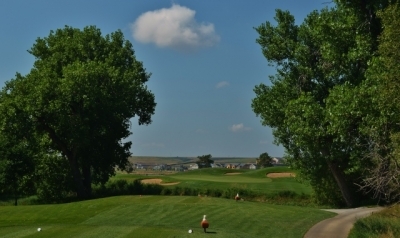 Chances are you’ll be having such a good time at Pelican Lakes that the occasional wayward ball won’t get you down too much. The day we played was warm and fairly calm but I’m guessing the Lakes can be a real stern test in the wind. The second shot on the par four finishing hole will leave an impression. 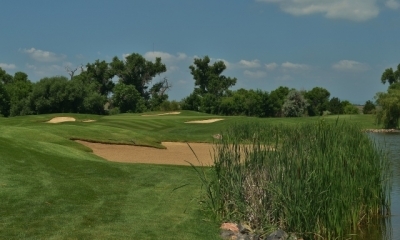 Having only played a couple Colorado courses, I can’t say for sure Kleve’s right. But when I’m back in Northern Colorado the next time you can bet I’ll be putting Pelican Lakes on my “must play” list. Consult the website for current conditions and rates. Due to the variable weather it’s always best to check before heading out.